By Seb Kemp/This review originally appeared in the November 2013 issue of Bike Magazine. Winter can take a long run off a short pier as far as I’m concerned. Where I live, winter means dealing with a choking layer of devil’s dandruff. It’s not impossible to ride, just really unpleasant sometimes. I can’t pack my bike away come November and wait till the spring, I’m in way too deep with my dependence on mountain biking to give it up, even for a few weeks. I don’t want to, I just can’t help it. I’m hooked. Come winter I persevere with my regular riding schedule, doggedly pushing through the snowbank outside of my home to find an exposed ribbon of muck and mire somewhere. Even though wet wintery rides don’t always fulfill me in the same way that autumn Velcro dirt days do, these dark-day rides are my methadone. Last winter I invested in a pair of Shimano’s MW81 Gore-Tex winter boots to help keep my toes on my feet while I hopelessly searched out my next kick of singletrack. The MW81 has an insulated Gore-Tex lining that repels water and the fleece insole also retains heat to keep your extremities cozy. The material is breathable so moisture can escape while keeping the cold air out. Did they work as advertised? Yes, very much so. Ninety minute rides that I would miserably endure while wearing regular shoes turned into three hours of toe curling bliss in the MW81. It wasn’t my feet that were begging me to return to a warm fire, it was my hands. The boot has a glass-fiber reinforced polyamide sole with optional spike mounts. It is rigid enough to adequately transfer power to the pedals and the massive lugs provide generous traction while the wide spacing prevent mud and snow building up on those inevitable off-the-bike adventures. The shoe is rather slim and elegant for a winter boot. Three, fat Velcro straps make sausage-fingered adjustments easy. While the fit, although snug (certainly double-check sizing before buying) is very comfortable. A neoprene ankle gaiter keeps the unwanted elements out but also provides a reassuring amount of protection. So much so that my ankles feel dangerously exposed in regular shoes now. The heel and toe box are reinforced enough that after six months of using these (they are so good I only shelved them once summer’s hottest months struck) they still look, relatively speaking, box fresh. 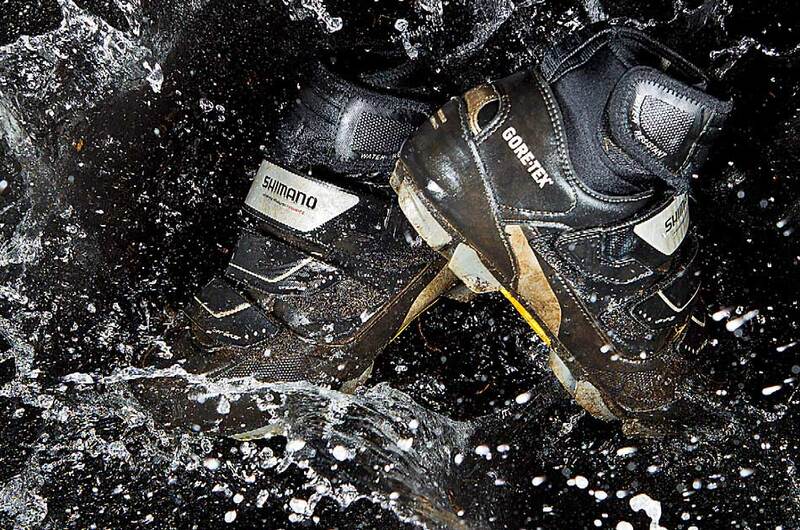 If you are a mountain biking junkie, winter riding doesn’t have to mean losing your toes. Not with the Shimano MW81 at least. November 19, 2013 in BIKE MAGAZINE.